Based on a true story and with jingoistic appeal, 12 Strong takes you directly into the heart of the battlefield — where 12 American soldiers set out to wipe out the Al-Qaeda backed Taliban from the land known as “the graveyard of many empires” — Afghanistan. “12 Strong” is the glorification of the Americans in a revenge drama. After the 9/11 attack of the World Trade Centre, when America was shaken, a dozen of emotionally charged Special Forces Operatives handpicked by Captain Mitch Nelson (Chris Hemsworth) go on a mission of utmost importance and secrecy, to annihilate the enemy, in the town of Mazar-i-Sharif. After bidding a teary farewell to their families, the soldiers are dropped into the wilderness, 40 miles away from their destination where they meet-up with Dostum (Navid Negahban), a local CIA agent and a warlord, who helps them in their endeavour. Though vastly outnumbered by an enemy who have no fear of death, how Nelson and his men navigate their way into the strategically positioned town forms the crux of the tale. Despite the modern artillery, soldiers riding on horseback like cowboys in the wilderness makes this modern day war film look like a period western drama. 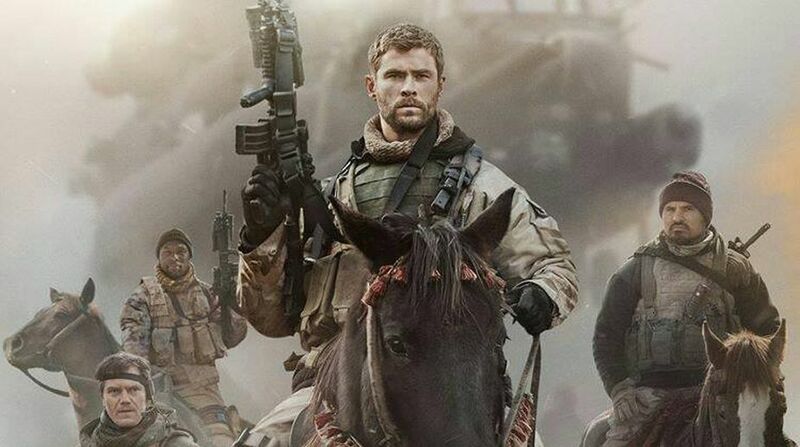 Picking off enemies with an assault rifle from atop a charging horse at full gallop, Chris Hemsworth as the understated but result-oriented Captain is impressive. And of his pack, it is Michael Shannon as Hal Spencer, Michael Pena as Sam Diller and Trevante Rhodes as Ben Milo who have some meaningful scenes. The rest are only there to fill the screen with nothing much to do. The film is virtually Hemsworth’s show and he, with his natural charm and charisma reminds you of his character Thor more than that of a strategic soldier. Apart from him, it is Navid Negahban as Dostum who with a strong screen presence makes a powerful impact as the key leader in Afganistan’s anti-Taliban Northern Alliance. The script, written by Ted Tally and Peter Craig, is compelling, complete with men promising their women that they will come home, a leader insisting that he won’t lose a single man, the bad guys executing women and plenty of battle scenes. Visually, the film is fascinating as it is mounted on a large scale, and projected with flair. Director Fuglsig’s collaborators, who include cinematographer Rasmus Videbaek, editor Lisa Lassek and a skilled battalion of stunt workers and visual-effects artists who have dramatized the challenges with appreciable consistency and precision. The tone here has a peculiar mixture of appealing and unvarying, fantasy-inspiring frames. Despite some gory and blood-curdling scenes that glorifies the war, the film fails to get into the complexity and futility of it. Overall, 12 Strong is both an entertaining and mildly cheerful yarn that keeps you hooked.